As all online slots fans will know, Vincent van Gogh was a post-impressionist painter of the 19th century who created some of the most recognisable works of art ever created such as Sunflowers and The Starry Night. Van Gogh is a release from Relax Gaming which plays tribute to this Dutch Master so read on to find out more. 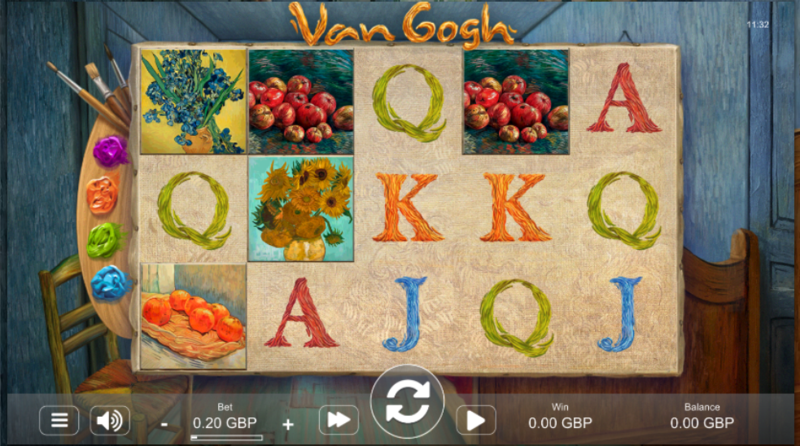 Van Gogh is a five reel slot with three rows and twenty fixed paylines; the game looks great with the symbols spinning on a canvas behind which is a an easel and the interior of a room straight from one of the great man’s paintings. The higher value symbols are all paintings and include Sunflowers, Still Life With Basket, Apples, Dish With Citrus Fruit and Irises; J, Q, K and A make up the lower values. Van Gogh himself is wild and he will substitute for all others to help form winning combos except for the easel bonus symbol. This occurs in the base game only and you will see blocks of wild symbols up to 3×3 in size added to the reels to help out with some decent wins. Purple – adds one free spins to a maximum of 15. Orange – adds 1x multiplier up to 7x. Green – adds one wild up to a maximum of five (one per reel) per spin. Blue – removes one lower value symbol – all four (J, Q, K and A) can be removed. This is triggered by landing at least three of the easel bonus symbols anywhere in view and the round will start instantly with all the features collected in the Color Splash round – a maximum of fifteen free spins and all the other extras. Van Gogh is a very high quality slot which manages to capture much of the artistic influence of the great man and the whole game feels as though it’s part of a piece of art. The features are clever, well designed and there’s a high-then-usual RTP of 96.83%. 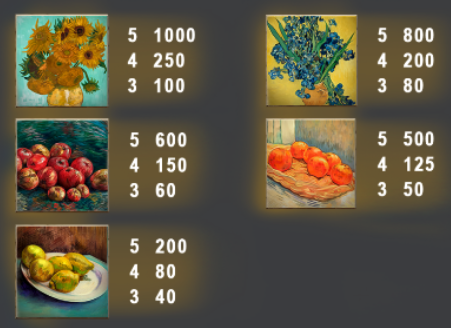 If you’d like to try another Van Gogh-themed slot, click here!